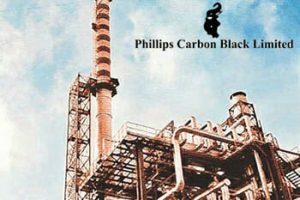 Phillips Carbon Black Ltd (PCBL), part of the RP-Sanjiv Goenka Group, is the largest manufacturer and supplier of carbon black in India catering to the needs of elastomer, plastic, paints and ink manufacturing industries. The major market for carbon black is tyre industry. They also manufacture special black for non-rubber applications. PCBL has capability & flexibility to produce any ASTM grade. Besides ASTM grades, PCBL also manufactures customized product specific to a customer. The biggest application of carbon black in rubber products is in tyres. It is added to rubber as a filler and reinforcing agent. For various types of tyres, it is used in inner liners, carcass sidewalls and treads. It is also used in non tyre rubber products such as belts, hoses, bumpers, shoe soles, wipers blades, conveyor belts etc. Non-rubber carbon black (including specialty carbon black) used in conductive packaging, film and sheets, fibers, moldings, pipes, semi conductive cables. It helps to enhance formulations and is flexible in meeting specific color requirements. It also provides pigmentation stabilization and conductivity in a variety of everyday and specialty high-performance products. The specialty carbon market is oligopolistic with 79% controlled by three large global manufacturers. PCBL has been constrained by limited capacity. With the increase in capacity by 56,000 tons, we expect volumes to increase by FY20. Higher profitability in specialty carbon is expected to increase PCBL’s EBITDA/ton from ~Rs.10,000 to ~Rs.13,500 by end FY20. Further contribution from specialty carbon will reduce the cyclicality of its profitability. The demand-supply mismatch in carbon black is likely to continue for the next two years due to higher coal tar carbon black prices and limited imports. As per current industry interaction, a ~200,000 ton demand-supply mismatch is seen in the tyre sector. The tyre industry is expected to grow ~8-10% and the input (carbon black) will grow in line. China is the largest producer (~40%) and exporter of carbon black globally. From 2010 to 2014, exports from China increased significantly, resulting in a decline in the operating margins of leading global carbon black operators. In 2015 however, China’s industrial sector was roiled by a series of environmental inspections by the Ministry of Environmental Protection (MEP), leading to plant closures, substantial fines, price hikes and shortages of key materials. In November 2015, the Indian government imposed an anti-dumping duty on imports of carbon black from China for five years. Chinese carbon black manufacturers predominantly use as raw material CBO (carbon black oil), a by-product of the steel manufacturing process. After November 2016, CBO prices have increased significantly on account of rising coal tar prices in China. PCBL produces carbon black using CBFS (carbon black feed stock), a by-product of crude oil. PCBL is currently running at close to 95% capacity utilization & is in the process of increasing capacities. The brownfield expansion of fungible rubber black capacity at Mundra is on track to come online by Q3FY19 and would add another 56,000 MT to the existing capacity of 515 KTPA. Thereafter, 32,000 MT expansion of specialty carbon black is likely to come online in 2 phases with the first line of 12,000 MT to come online by end of Q4FY19 and another line of 20,000 MT to come online by Q2FY20 (earlier expected to be completed by Q1FY20). The overall outlay for the aforementioned expansions is expected to be around Rs.450 cr. Q1FY19 sales increased by 22.1% yoy while EBIDTA margins increased by 564 bps to 20.1%. Blended realization in Q1FY19 increased by 32% yoy and 7% sequentially, while overall sales volume increased by 1% yoy. EBITDA/ton increased 68% yoy owing to product mix shift towards value-added products, price hikes for tyre customers and general supply tightness in rubber carbon black. The Company has managed to reduce debt by ~44% in the last three years which has helped reduce interest costs and improve profitability. Given the strong cash flow projections over the next few years planned capex can largely be funded by internal accruals. We believe PCBL is likely to be a key beneficiary of shortage of carbon black in India. Further, management’s strategy of increasing its volumes in favor of high margin specialty products is likely to drive up margins. This coupled with global demand supply tightness is likely to keep contribution margins high for rubber carbon black. liked your article…. insight is limited in terms of valuations etc. Recommend a BUY on the stock with a price target of Rs.324/sh (12x FY20 expected EPS of Rs.26.99/sh).